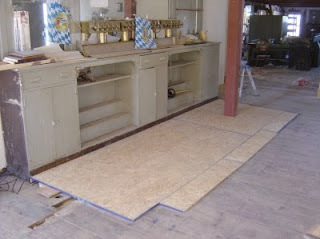 As preparation for the bar I installed a subfloor today, which not only covers all the holes in the floor from the previous bar setup, but also levels the floor (for the most part). E! started clearing the backbar so she can start painting it, maybe tomorrow.